Meet one of our 2018 Guest Artists for NJ SummerDance! Guest Artists’ Master Classes are included in full registration or can be attended at a drop-in rate of $30/each. Email Company Manager Madeline Moore, mmoore@carolyndorfman.dance, with any questions. Click here to learn more about NJ SummerDance, and click here for the complete drop-in class schedule. NJ SummerDance 2018 welcomes Artistic Director/Founder of nathantrice/RITUALS Nathan Trice. This contemporary modern master class is described as Athletic, Physical, Fluid and Gestural. 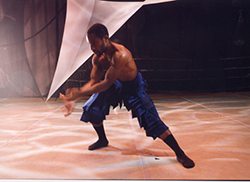 Nathan Trice is the founder and artistic director of nathantrice/RITUALS, a project-by-project contemporary dance theater company based in Brooklyn, NY. The company’s mission is to reflect the importance of empathy, compassion and understanding, in the pursuit of global humanism. nathantrice/RITUALS has lived and developed its projects in residence at RestorationART for the past 14 years. Projects to date include: Recognizing Women Project, Summer Intensive Project and Strange Love: EPISODES. Since 1998 the company has toured throughout the US, Aruba, Bermuda, Japan and Hong Kong. In addition, Trice is the co-director of ChoreoQuest, a choreographer-in-residency program at RestorationART which provides choreographers of African descent in the five boroughs of NYC the resources to incubate and develop innovative new works. He also is the co-founder of Artist Co-Creating Real Equity (ACRE), an inter-generational, multi-racial group of artists and cultural workers committed to organizing for racial equity in the influential realms of art and culture, arts and education, funding, media, curation, casting and space. For more information visit: www.nathantricerituals.com.